Ellipse2D is the shape of an ellipse. An Ellipse2D that stores its coordinates using float primitives. Ellipse2D is defined as abstract. 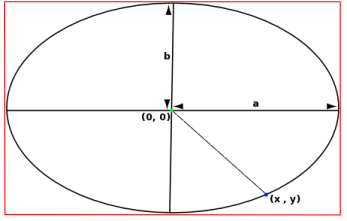 Determines if a point is contained within the ellipse. Determines if a rectangle is completely contained within the ellipse. Returns a PathIterator object corresponding to the ellipse. Note: An ellipse cannot be represented exactly in PathIterator segments, the outline is thefore approximated with cubic Bezier segments. Determines if a rectangle intersects any part of the ellipse. Ellipse2D is defined as abstract. Implementing classes are Ellipse2D.Float and Ellipse2D.Double. x - - x coordinate of the point. y - - y coordinate of the point. true if the point is within the ellipse, false otherwise. true if the rectangle is completely contained, false otherwise. at - an optional transform. true if the rectangle intersects the ellipse, false otherwise.